For instance yesterday it showed up in a National Geographic special on how our environment shapes our decisions for us. That photo up above is a still from the special which is teaching those who view it two things that aren't true. Firstly that fat people are lazy. Secondly that stair climbing is associated specifically with weight. Hopefully at least one of the National Geographic producers who green-lit the experiment finds their way here and takes a minute to watch the video I'm posting below of the world class obesity researchers and clinicians who I filmed taking the escalator at a recent obesity conference. 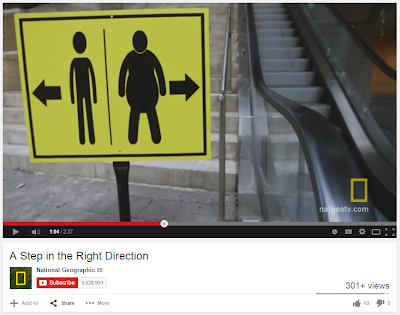 That clip pretty clearly demonstrates two things, firstly that taking the escalator over the stairs is a very normal behaviour and not one relegated just to those with obesity, and secondly that I fully agree with National Geographic in that without environmental cues, we don't as a species seek out physical activity when an alternative is readily available regardless of whether or not we know better. And really, that's what's most staggering (and ironic) about this in that the premise of the National Geographic story is that behaviours like stair climbing vs. escalator riding aren't in fact governed by simple conscious choices and instead are greatly influenced by our environment, yet in their execution of trying to prove that point, and by means of ugly, stereotypical weight bias, they end up suggesting to the public the opposite is true and instead reinforce the message that unlike skinny folks, those with weight clearly, consciously, choose escalators (and sloth as a whole) more often.